Hello and Happy Thursday! I hope you are having a fabulous day! I'm super excited to be joining my friends for the November One Stamp At A Time Winter Holiday Blog Hop! If you've already been hopping you should have landed here from Jenny Hall's fabulous blog and thank you for continuing on! If you are starting with me you'll want to be sure you stop by every blog for some awesome Winter Holiday Inspiration. As for me.. Christmas is where it's at! It's that time of year where most of us celebrate the birth of Jesus. For me Jesus is the reason for the season! 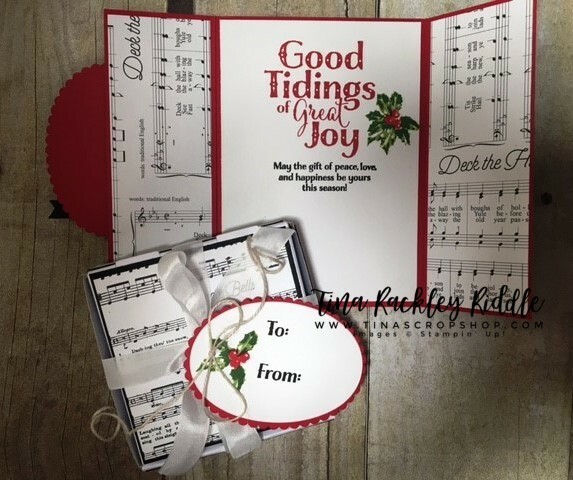 I love the Good Tidings Stamp Set from Stampin' Up! and thought it looked amazing with the Plaid Paper from the Christmas Around the World DSP. The "Merry Christmas" banner was from the Santa's Sleigh Stamp Set. I used Washi Tape to omit inking with Versamark the "wishes" from "Merry Christmas Wishes". Then heat embossed the sentiment in White. I also added a few Pretty Pink Posh Onyx Sequins because of course you have to have a little bling! I couldn't help but use the Merry Musical Specialty Paper on the inside. I loved the sheet with "Deck the Halls" and thought it went perfectly since I had a Bough of Holly on the card. For my project I used a mini pizza box as a treat box and used more of the Merry Musical Specialty DSP matted in black on the top and all of the sides. 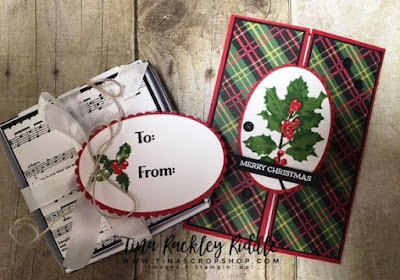 I used the same size oval framelits to make my tag and the same Good Tidings stamp set to make the tag. I love using circle framelits or oval framelits to make tags by punching a hole on one of the sides. Thanks so much for stopping by! The next stop on the hop is amazing Rick Adkins! Just click the next button and you'll be there! So simple and pretty! The music paper is a great addition to that set!